Instagram offers a good choice of customizable filters to enhance your pictures, but if you've been using it for a while, you'll have noticed that some of the most popular and influential members often add a little something extra to their snaps. Whether it's a neatly styled quote, a slick border or an unusual effect you won't find in the app itself, their pictures often feature something that sets them apart from the crowd. To give your own photos a similar edge, you'll need a separate photo editor, but there's no need to spend ages tinkering with setting to create something Instagram-ready. Here we've picked out photo editors created with Instagram in mind, offering specially designed templates, filters and other effects specially designed for the social network. Fine photo editing is always easiest with a mouse or stylus, so here we've focused on desktop tools. The Instagram desktop apps don't support uploading, but you can easily get around that with our handy guide to uploading photos to Instagram from your desktop. ‘A spark is worth a thousand likes’, says Adobe – and we’re inclined to agree. Adobe Spark Post is a great browser-based tool for creating great-looking cards and social media posts, and is ideal for giving your Instagram images an edge. It's packed with options, but so well designed you can create something stunning with no photo-editing experience at all. Log in, then click the blue plus icon and select ‘Post’. Either start from scratch or pick an Instagram template from one of the available categories (including food, lifestyle, seasonal and many more). You can spend time picking your own colors, fonts and other elements, but there are so many carefully designed palettes and designs curated by Adobe that you can make something stunning with just a few clicks. When you're done, save the resulting image as a JPG and upload to Instagram. Canva is packed with Instagram-ready templates just waiting to be filled with your own photos and text. Register and log in, then select ‘Create a design’ followed by ‘Social graphic 800 x 800px’. Strangely, not all the layouts that appear on the left-hand menu will actually be this size, but many will. You can use any design marked ‘Free’ to create your Instagram image (the others are only available to premium account holders). Click ‘Uploads’ to add your own photos, then drag them onto the template. Replacing an image is easy; just drag your new photo over it until it’s highlighted and let go. All text and images are fully editable, and you can easily add unique filters and other effects. Once you’ve finished, you can download the resulting image to your desktop, ready to share on Instagram. 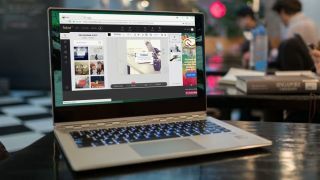 Fotor is a fantastic free online photo editor packed with tools that’ll help prepare your snaps for Instagram with templates, text and its own set of filters. To get started with Fotor, use the button at the top right to register for a free account or connect with Facebook. Click ‘Create a design’, scroll down to ‘Social media post’ and choose ‘Instagram post’ to start creating an 800x800 image for your feed. There’s a great selection of templates on the left. Those marked with a diamond icon are only available to premium subscribers, but there’s a great selection for free users and more are added all the time, including special seasonal designs. Scroll through until you see one you like, or use the search tool for find something specific. Don’t worry what the example text says; it’s editable. Once the template has loaded, click the gold ‘unlock’ icon at the top right and you’re ready to start customizing. Click the ‘Import’ button on the right to upload a picture, then drag and drop it into position. To move your pictures behind the text and any other graphics, select ‘More’, followed by ‘Layer’ and ‘Move down’. Unlike the first three Instagram photo editors in this roundup, piZap doesn’t offer a huge array of templates to work with. Instead, it gives you a blank square canvas and all the tools you need to make something from first principles. The main appeal of piZap is its flexibility. You can upload photos from your desktop, Facebook, Dropbox, Google Photos or Google Drive, then dive straight in and start editing. Some filters and tools are marked ‘Pro’ and only available to premium subscribers, but there are still lots of options available to free users. One of piZap's greatest strengths is its selection of unusual filters with effects like starbursts, and fun stickers to apply to your pictures. When you’re done, simply save the edited photo to your desktop, ready to upload to Instagram. Polarr is available for pretty much all platforms, including Windows, Mac, iOS and Android, but here we’re focusing on the web app. The editor lacks Instagram-specific templates, but you can easily crop your uploaded picture to a neat square using the aspect ratio tool on the right. This also lets you rotate and flip your picture with far more freedom than provided by the Instagram app itself. Polarr offers a great selection of filters, plus fine control over brightness, contrast, highlights, shadows, exposure and many other options. The brush tool is exclusive to the premium version of the app, but clicking the ‘+’ icon in the bottom right reveals some other options available to users of the free edition, including a tool specifically designed to enhance faces. Once you’re done, you can export your image (with a watermark if you like) at a quality setting of your choice. There’s a small selection of file formats available, but for uploading to Instagram we recommend JPG.